Sticky Post for read-a-thon updates...please scroll down for newer content. Thanks! I would make me a full body suit which would cover me from head to toe, including head, using the material from those light blocking, black out curtains with only holes for my eyes and I would wear the strongest UV blocking sunglasses I could find. The three items I would grab? Well, since I’ve been alive for a very long time and all of my loved ones are long dead, I wouldn’t be worrying about grabbing them. However, I must always have a cat and that pesky cat just HAD to run out in the sun so, of course, I have to grab her. It also seems that my other two precious objects were in a drawstring rucksack and the silly cat got the strings around her neck whilst playing with them and drug it out in the sun as well. The other two precious objects contained in that bag are my black book with all the vampire safe house locations around the world and my locket with the pictures of my precious sons who have been gone for years. No way can I lose any of that stuff, although I might rethink the cat for putting me through this in the first place! So, I was reading Abraham Lincoln: Vampire Hunter yesterday and hoped to finish it before seeing the movie today. Well, I didn't. Still saw the movie though. Liked it pretty well, but bummed that two parts from the book were left out. Overall, I'm liking the book more, I think. Anyway, just completed the mini-challenge hosted over at The Non Reluctant Reader. 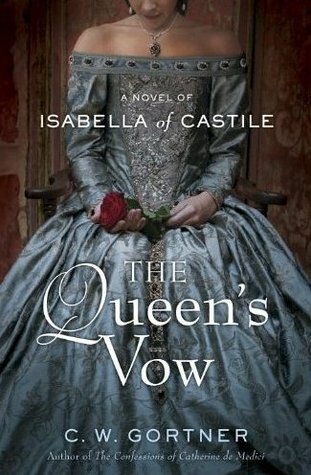 Completed two mini-challenges (off blog) Currently reading The Queen's Vow by C.W. Gortner. I have to finish this before tomorrow morning. My review is due tomorrow! My most anticipated read of the summer is this lovely book that was released last Tuesday. And guess what? I'm reading it now! Oh the Queen's Vow and margarita's good choice. Good luck with the read-a-thon! Hello! I just finished Abe Lincoln a couple weeks ago, I'm interested to see what you think. It was kind of flat to me, but then it is supposed to read like a biography. I'm interested to see the movie, there are some actors I really like in it! Happy reading!